Fresh homemade cheese cooked in a creamy spinach sauce. Croquettes of fresh cheese simmered in a light creamy sauce garnished with nuts and raisins. 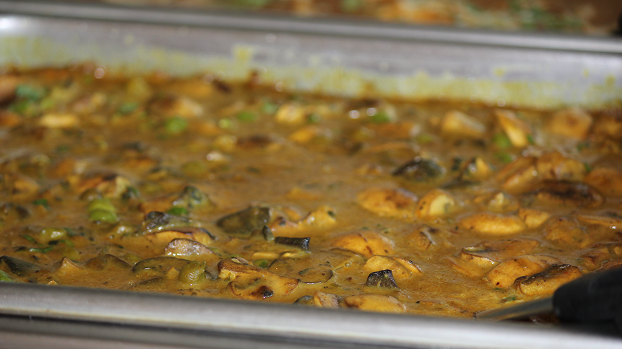 Fresh mushrooms with cashew nuts and green peas cooked in a lightly creamy sauce. Chic peas slowly simmered with tart pomegranate seeds cooked with onions, tomatoes, and spices. A delicacy of Peshawar. Eggplant grilled over charcoal, mashed, and cooked with fresh tomatoes, onions, garlic, ginger, and spices. 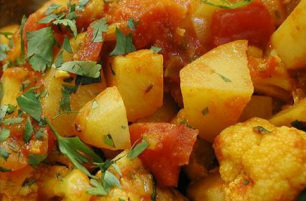 Fresh cauliflower and potatoes cooked with ginger, tomatoes, peas, and mild spices. Fresh okra simmered with diced onions and tomatoes lightly spiced. Stir fried fresh garden vegetables sauteed with mild spices. Simmered black lentils and red kidney beans sauteed with tomatoes, ginger, cumin, onions, and fresh garlic. 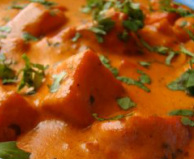 Assortment of vegetables cooked with dry fruits in a light creamy sauce. Fresh homemade cubes of cream cheese cooked in a delicate tomato cream sauce. 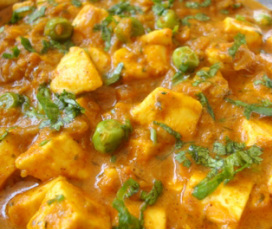 Fresh homemade cheese cubes cooked in a light gravy with green peas.